Surrounded by the North Atlantic Ocean, Icelanders have a strong link to the co existence of the life of the local Fishermen. For more than a century the people, from the Island in the north, have strong ethnic links to their harsh life in one way or the other. The saga behind their tales has touched up on nearly every single person in the land whether through growing up in a small village or the capital of Reykjavik, everyone has a story to tell. The new Autumn Winter 2019 collection embraces the brands strong links to the fishermen and the North Atlantic Ocean by adding new prints and colors. The new prints and styles include cuts that relate the fishermen outfits and prints that have strings of Fish Nets as well as few SeaWorld creatures such as a Starfish and an Octopus. Black is the main color throughout the collection yet still it is being spiced up with Ocean Green, Grey, Sea Blue and Pale Pink. Establish in 2012, Mói is an urban children’s fashion brand originating from Iceland. 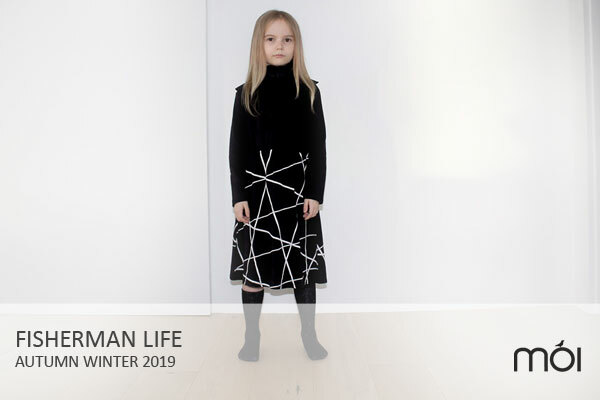 Mói’s primary focus is creating stylish and funky clothes for children with a dash of attitude to inspire sustainable living, being free and of full of desire to make the earth a better place. This is done through certified production methods, which are responsible, ethical and organic. Preorder Deadline: March 15th 2019. Launch Date: Estimated August 25th 2019. February 10, 2019 | Filed under News.